I haddock great time. You really trout to sea it. It’ll only cost a few squid, and you’ll have a whale of a time! The DCEU has had a rough time staying the course amidst some seriously choppy waves. Whilst Man of Steel and Wonder Woman provided passable entertainment, the likes of Batman Vs Superman and Justice League (a film that, retrospectively, I was far too kind to in my review) bored moviegoers with pretentious dialogue and moody stylings. DC needed a break desperately, and whilst Aquaman isn’t likely to set the world alight, I’m pleased to report that we might just have been treated to the best DCEU film so far – which, admittedly, isn’t much kinder than saying that a particular kidney stone passed without overwhelming pain, but I digress. 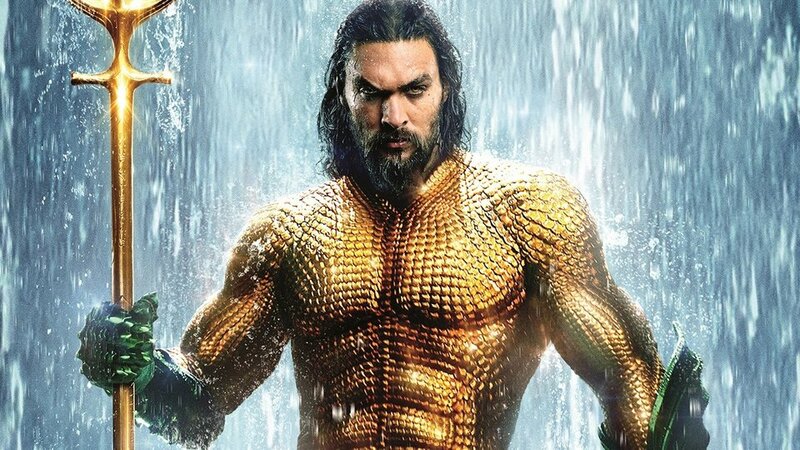 Jason Momoa is back from Justice League as the half-human, half-Atlantean ‘fishman’ Arthur Curry, AKA the titular Aquaman. He’s joined by the stunningly-beautiful Amber Heard as Mera, the conflicted fiance of Arthur’s half-brother Orm (Patrick Wilson). If this all sounds a bit Corrie that’s perfectly understandable, but the relationship between Arthur and Mera is at the heart of the film, and their banterings work surprisingly well, with Momoa and Heard sharing a sparkling chemistry. Wilson is slightly flat as the villainous Orm, alias Ocean Master, but arguably the challenge posed by his character is simply a part of the scenery. The true adversary in the movie is Arthur facing up to his identity, and Momoa paints a strong portrait of conflict as he carves out a legacy for himself in a confusing world. That said, Infinity War set a benchmark this year for fantastic comic book villains with Thanos, so the lack of a compelling antagonist in the film is an undeniable letdown. The supporting cast help keep the film afloat. Willem Dafoe subverts expectations by playing a non-villainous character, Atlantean advisor Vulko, who is an enjoyable presence throughout. Yahya Abdul Mateen II fills out the role of supporting villain as Aquaman nemesis David Kane/Black Manta, but isn’t given much depth beyond a generic familial revenge plot (Killmonger anyone?). There are also small parts for Dolph Lundgren as fellow underwater ruler Nereus, and Nicole Kidman as Aquaman’s mum Atlanna, but neither make a real splash. The plot is scarce on originality, borrowing generously (but most likely coincidentally) from other 2018 superhero films such as Black Panther – the worldbuilding and characters are similarly centered on monarchy – and Ant Man and The Wasp – Arthur and Mera’s descent into the kingdom of the Trench evokes that film’s Quantum Realm. The film focuses on a fun and forgettable adventure to find an ancient trident, which culmimates pleasingly in Arthur’s adoption of his goofy comic book costume. Anything involving Arthur’s parents and childhood is intriguing, but the movie does pull a little too heavily on a few too many threads. There’s almost no room for innovation for future instalments, with far too many elements thrown into this first imstalment’s story. Black Manta and his plot could have easily been saved for the sequel, freeing up a baggy narrative that too often anchors the film with distracting conveniences. Where the film truly stands out is in it’s mesmerising world. Aquaman envisions Atlantis as a beautiful underwater metropolis, with some fantastic creature design and smart technological designs that help answer any questions one might have. Tiny artistic touches – like the differences between different underwater kingdoms’ cultures and populations – make the world feel truly alive and absorbing in a way that even Black Panther’s Wakanda could not achieve. Director James Wan – who famously cut his teeth with horror projects like Saw and Insidious is a brilliant choice for the DCEU, and his guiding hand (or fin) can be witnessed throughout, with excellent cinematography, in both nautical and landlubber scenes. What really cements the film as one of the DCEU’s treasures is the overall sense of fun to be had. There is none of BvS’ dour tone to be found here, in a movie that much more closely resembles Indiana Jones than a superhero flick. There are moments of hilarious stupidity – Black Manta’s dad firing an RPG at Aquaman whilst in a fully-submerged submarine is a standout one – but they only contribute to the enjoyment. If you, like me, are seriously over the depressing palette of previous DCEU movies, Aquaman could be the film to restore the faith. Now let’s hope Shazam can keep it up. Aquaman, directed by James Wan, is released in the UK via Warner Bros Pictures, certificate 12A.